I believe there are several reasons that splenic infarction is often associated with Familial Shar-Pei Fever. It is well known that protein-losing kidney disease often accompanies FSF. Renal amyloidosis can result in protein-losing kidney disease as well as immune-mediated glomerulonephritis. This results in urinary loss of antithrombin III and other coagulation proteins leading to a hypercoagulable state which can result in thromboembolism. It is also known that FSF results in vasculitis or inflammation of blood vessels. This leads to damage of the lining of the blood vessels and potential activation of the coagulation cascade as well as platelet activation. FSF also causes release of acute phase proteins from the liver such as tumor necrosis factor, C-reactive protein, cytokines and other products which can activate the platelets and the coagulation system. Systemic Inflammatory Response Syndrome (SIRS) leading to disseminated intravascular coagulation (DIC) often leads to thromboembolism. Hepatic amyloidosis involving the liver can result in deficiencies of coagulation factors as well. Clinical signs include acute collapse, anorexia, lethargy, vomiting, polyuria/ polydipsia, pale mucous membranes, abdominal pain and sometimes a palpable abdominal mass. I would include this syndrome in my “ain’t doing right” (ADR) dog category. Laboratory findings may include anemia, higher white cell count, increased platelet counts, increased liver and kidney enzymes, low serum albumin levels and abnormal coagulation tests. Radiology may reveal a lack of definition in the anterior abdomen where the spleen is usually seen in the lateral view as a distinct triangular shadow (see Figure 1). Ultrasound is a very useful diagnostic tool as well. 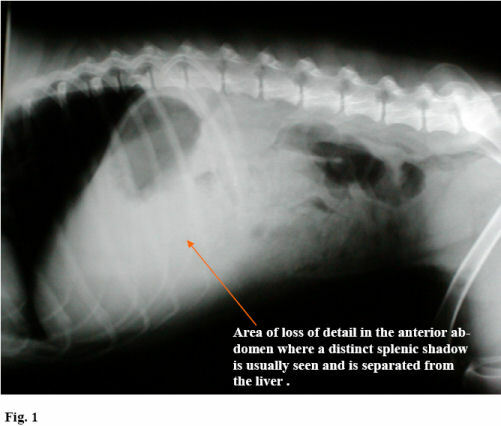 Treatment involves exploratory surgery and removal of the spleen. Mortality is high due to the underlying causes, coagulation problems such as DIC and other organ involvement. 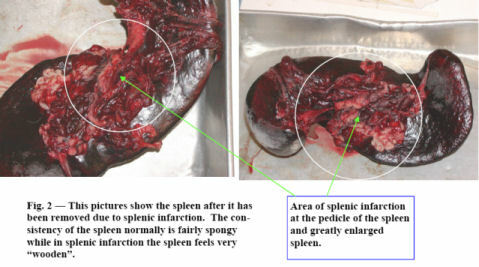 What is the spleen and what does it do? The spleen is important in the primary immune response – probably as important as the lymph nodes in that regard. It has several functions including acting as a blood filter removing old red blood cells and filtering out antigenic particles (such as bacteria, viruses, protozoa, rickettsial organisms, etc. ), acting as a storage organ for red blood cells and platelets and serving as a primary organ participating in immune responses. Histologically the spleen consists of two components: the red pulp and the white pulp. The red pulp functions in red blood cell storage and antigen trapping due to its large population of macrophages or antigen presenting cells. The white pulp contains lymphocytes and here is where the immune response occurs. Antigens trapped in the spleen are taken up by macrophages in the white pulp which eventually results in a proliferation of antibody-producing cells known as B-lymphocytes. The antigens processed in the spleen also result in “lymphocyte trapping” phenomena which causes the lymphocytes to stay in the spleen increasing the efficacy of the immune response.